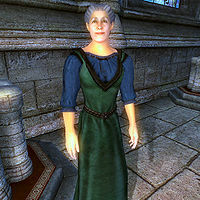 Selene Duronia is an Imperial priestess who is added by the Knights of the Nine official plug-in. She sells spells at the Chapel of Dibella in Anvil. She is a replacement for Trevaia, who is killed when you first install the plugin. She will only appear after you have completed all of the Knights of the Nine quests. Selene Duronia has exactly the same spells available as Trevaia, but her schedule makes it much easier to purchase the spells from Selene. You simply have to talk to her during one of the time periods when she offers services (see the table section "Services" to the right side of this page). Note that like Trevaia she will buy potions but not sell them, because neither have a hidden merchant container. Selene wears a blue & green outfit and a pair of doeskin shoes. She carries the Anvil chapel key and a moderate amount of gold. Selene doesn't wield any weapons, choosing instead to rely on a series of spells from the Conjuration and Restoration schools of magic. These are also the same spells which you can buy cheaply off her, as her Mercantile is a mere 10. She is referred to as Charde by game data. This page was last modified on 13 July 2018, at 03:22.